LED footwear with motion sensors and an app to control the lights. Light up sneakers have come a long way since the days of LA Gear. Hoping to take that category to a whole new level is the crowd-funded Orphe project, which involves light up sneakers with LEDs that can switch colors. 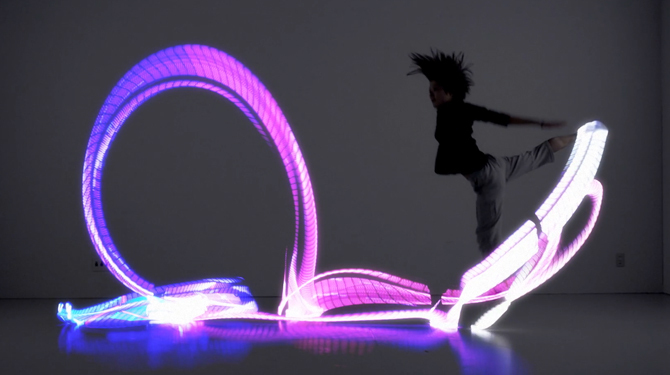 The lighting on the sneakers can be controlled by movements of the feet or by an app, and users can even create customized lighting patterns. The sneakers seem to be aimed mostly at dancers for the time being, but the embedded motion sensors that save data on the wearer's movements could prove useful for other applications in the future, as mentioned by the creators in the below promo clip. The light-up Orphe "smart-shoes system" is currently seeking funding on Indiegogo.